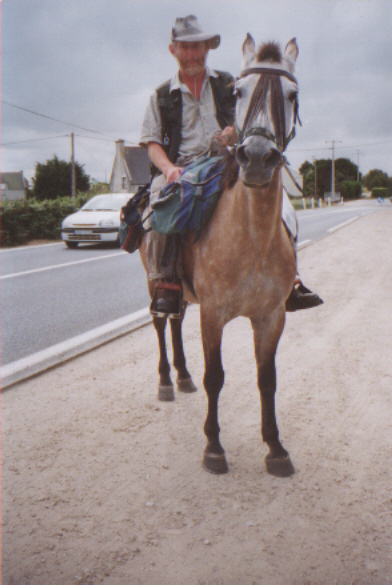 Tipperary born adventurer Steve O'Connor - the first Irishman to be accepted as a Member of The Long Riders' Guild - and his Spanish steed Colina have arrived in Ireland to complete the last leg of their European Pilgrimage - they completed a trek of 3000 kilometres from Seville to Penzance, in Cornwall, via Santiago in September 2002. We at The Guild believe this trip may be of major historical importance. If Steve rides to all four corners of Ireland, he will be the first person in modern history, perhaps in recorded history, ever to have done so. There is no record of anyone in Long Rider history having made a ride similar to the one he is planning. Steve is doing the trek to raise awareness of the problems of mental ill-health and in particular BiPolar Disorder. Steve expects the trek to take 8 to 10 weeks and probably cover 1700 to 2000 kilometres. Steve is making the trip to mark his recovery from a bout of manic depression that nearly ended his life. Unfortunately Steve has had to end his trip before he completed his journey to all four corners of Ireland. Steven was having problems with the medication he has to take for his Bi-Polar disorder, and he and Murphy have returned to their home in Cornwall. Before they stopped, however, Steven and Murphy made it more than half-way around Ireland, which makes it the longest recorded Long Ride in Irish history. For further information about this trip, and Steve's previous Long Ride, please visit: http://www.pilgrimhorse.info. To read an interesting article about Steve, please click here.